Before I give a glimse of our visit with Vanya, I want to just thank everyone that has prayed for us and Vanya over the past few months. To witness and experience the power of so many prayers from all over the world is so powerful, so overwhelming, so indescrible. I am so humbled that God has chosen us to be Vanya’s parents. I think He must have something really big planned for Vanya. The day I’ve been waiting for arrived and it was AWESOME! The social worker told us that she was going to talk to Vanya before we could see him so that he wouldn’t “lose his mind from happiness” ! I’ve never heard that phrase, but I will never forget it! The first few moments were awkward, and Vanya was nervous. But after we did some drawings and looked at some pictures, it all felt so right! Everyone in the room – the social worker, psychologist, orphange workers, Marianna, Vanya and us – we were laughing and tearing up. God is so gracious that Vanya has had good care the last two years. He loves the sea, so we all drew pictures of the sea. 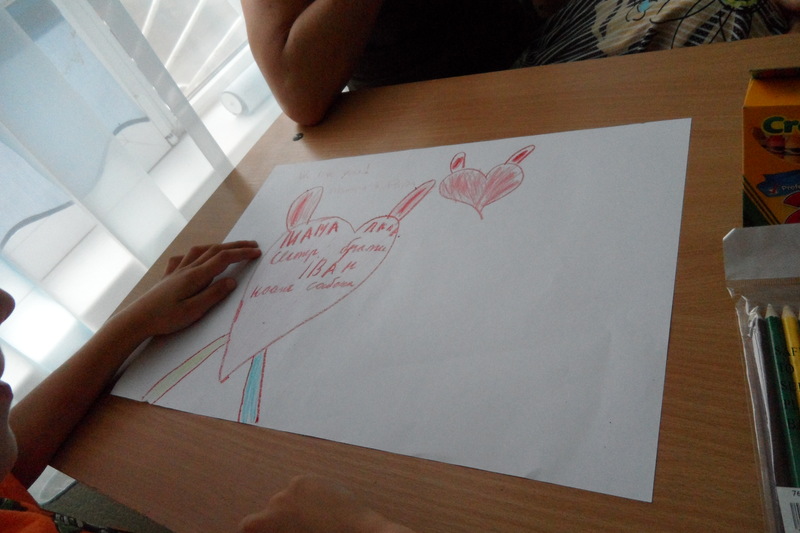 Mat drew a heart, and then Vanya drew a heart, and then Vanya wrote inside his heart (in Ukraine) Mother, father, brother, sisters, cat, dog (our pets), and his own name, which he wrote Ivan. He then colored it with the colors I had said earlier were my favorite. What a moment – we represented our complete family in his heart! Interestingly enough, when asked what he wanted to be called, he said Ivan (pronounced ee-vahn in Ukraine). Ivan is his formal name and Vanya is a common nick name and the social worker said he wanted to be more “grown up”. So, we had thought about Evan as a name, as it sounds more like how Ivan is pronounced in Ukraine (and Ivan pronounced in English is not so appealing). Initiall y I was not crazy about naming him a common US name, but when we looked the name up, can you believe this – it is a form of Ivan, which means (once again) “God is gracious” and in celtic “Young warrior”. It really does fit him…but we will table that for now. I’ll write more details tomorrow. What a blessing to have had our referral today, because now we can go visit him even through the long holiday weekend! for you. I read the post to Brad through tears of joy. Pictures are GREAT! Can’t wait to meet him and love on him. Love you! Wow. I am crying over here. I truly am speechless. What an amazing moment. I’m so happy for all of you (and I don’t even know you!!) THank you for sharing this sweet moment. Beautiful! Congratulatons for this wonderful son. I am so happy for you my dear friends. My heart is exploding with joy. God is so faithful and is this is the work of His hand. Evan is the perfect name for him! I am going to log on for you and try to straighten out your pictures. We love you! Thanks for the help!!! We love you! totally forgot the login. duh!!! sorry, couldn’t fix it!! What an adorable, sweet, precious young man. He fits in both of your arms perfectly. So thrilled for you and can’t wait to see the 6 Fishies all together in a glorious celebration of love. Thanks Lesley my sweet, sweet friend. You are part of the answer to prayer as God gave us you, April, Carrie and so many others as support through this time. Thank you ALL for your prayers and support! I only had to read the title, and I was already in tears… then, the rest of the post… the reasons for the title, the photos, the knowledge that he knows his family and that he is already attaching to you all…. so many prayers have been (and continue to be) answered. So beautifully. I’m so happy for you guys!! Praise God!!! So glad that Vanya has his family now!! I actually like the name Evan, and it is close to the name Ivan. I am sure he would rather have an American name, especially after he starts school, starts using English more, and meets new friends. What middle name will you give him? I have 2 suggestions: Evan Matthew (assuming that Matt’s real name is Matthew), or Evan James after the missionaries you are staying with that knows Ivan (again assuming his name Jim is really James). I am so happy you are there and he looks really happy and proud to have a real family. I can see that my corrections did not take. Sorry my post sounds kind of strange. Mat actually spells his name with one “t” as it was misspelled at birth… I like your thinking. Rejoicing thru tears and thanking God for graciously, providing a loving family for your young warrior. I stand in awe of God drawing families together from all parts of the world. It is so beautiful. I’ve been waiting all day for this post and it does not disappoint. I am so thrilled for ALL of you. Thank you for sharing your journey of making Vanya part of your family. Tears of joy here too! What a beautiful little guy, and a beautiful family. God bless you guys!!! Just beautiful. Thank you so much for sharing your joy. Praying for the rest of the process of getting him home going smoothly. I am so happy for you guys! My hubby and I are in the adoption process right now (the seemingly endless paperwork part) and we are so happy when we get to hear about such great stories like your’s! Keep the faith. That is part of the ransom you have to pay. We will be praying for you. What a night for rejoicing! I’ve been awaiting this post all day 🙂 It was like waiting for a friend to announce the birth of her baby. I’ve held (and remain to) all of you in my prayers, and am so glad it all went so well. 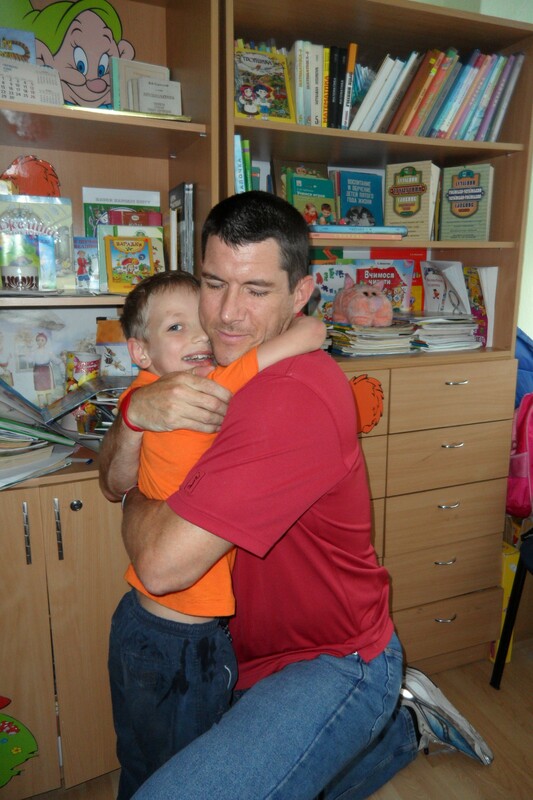 I can’t imagine Vanya’s excitement when he finally heard that his family was coming! Congrats! That pic is PRICELESS!!! just so sweet. CONGRATULATiONs to you all! Oh gracious! God is so good! I could look at those sideways photos all day. Thank you, Father! Congrats, guys!!!! I just had to respond to your comment on Vanyas name. I had a big smile on my face. When we adopted our son I really wanted to name him Ivan. It is my fathers name, I love and cherish him dearly and I couldnt have asked for a better earthly father. Anyways, my hubby just couldnt do it. It different. I loved it – he didnt and so we settled for Evan as a compromise. We did the same thing when we looked it up in the book and found that Evan is a derivitive of Ivan (or vis-versa) . Than we knew it was meant to be. I also love the meaning! Congrats to your family as you are so blessed to have him in your home to be a part of your family. He’s gorgeous! I’m so so happy for you! Oh I wonder if he’ll be able to sleep tonight! What must be going through that little boy’s head as he lays in bed??? So happy you will be able to go back and see him tomorrow as well!!!! So happy that you met your sweet boy, I’ve been praying for your journey since Adeye posted about him. We’re in U right now adopting our little guy and I know how wonderful that “meeting” moment is! Blessings to you! This is beautiful!! I am so happy for him and for you guys!! His big blue eyes are to die for!! Also, you have to turn your photo in a photo editor before you upload it. Any simple photo editor will do – Google’s “Picasa” is free and can be downloaded from the web. You just click “rotate” and then save it upright. That way it will upload in the right position. We think of you often. It is just still mind blowing how you are so woven into this story. I can’t wait to tell you how God was also working on people’s hearts here to find Vanya a family, and how God lined up the timing so perfectly. The God of details – wow. I can hardly wait to hear the details. I couldn’t hold back the tears in church this morning as we sang, “How Great is our God.” All I saw was Vanya’s little face before me. This is what redemption looks like, my friend. The lump! I could barely hold back at the sight of that photo of Vanya wrapped in Mat’s arms! I know we haven’t had a chance to meet yet, but JD and I enjoyed meeting Mat several weeks back at the DeLilles. We are over-the-moon happy and excited for you all. I don’t have words to describe how amazed I am at the mighty hand of God. Continued prayers! Hello you do not know me, but I am friends with Marianna, Jim & Sasha. Four years ago my husband and I made the same journey you are currently on, to find our son. I am so blessed to read this post. My heart wells up with joy. Praise God, you have found your son and that Vanya has found his parents. We have been praying for a long long time! The angels must be rejoicing that your family has been united at last! Blessings as you enjoy this next chapter in your lives being parents to such a sweet boy. 🙂 I am so happy! Oh my, oh my, oh my. How awesome is our God. Those pictures just made by heart leap. What a precious little boy. What a precious family. yahoooooo!!! Rejoicing and praising over this family that God has grafted together!!! Why the heck would you change an 8 yr old boy’s name???!! That is all he has from what is familiar! And, he told you that he prefers to be called Ivan! I just love this post! My heart is filled with happiness for you! Little Vanya/Evan looks like he belongs in your family–because he does! Congratulations and blessings to you on this new journey! I have been so blessed by following along with the story God has written for Vanya, and your family. Thank you for sharing. We are privileged to pray. Our Lord is mighty! Congratulations to each of you! You don’t know me, but I have been following your story on Adeye’s blog. From the first moment that I saw your son, I have been praying! It is so awesome to see what our Almighty Father has done! I get teary thinking about it! I’ll continue to pray for you and your family for the journey ahead of you. I have this really lovely name book, and I looked up Evan’s name. Here’s what it said : Inherent meaning, Young Warrior. Spiritual Meaning, Noble Protector. And his scripture is Philippians 4;13 I can do all things through Christ which strengthens me! Awesome hey! So happy for all of you!!! What an answer to so many prayers!! You will all be so blessed to have each other! Thank you for sharing “the rest of the story ” with us!! God is so faithful and yes, he does work in the small details of our lives! What a joy to know He cares for us on such a level! Beautiful pictures, beautiful boy, beautiful family! Praising God for this story and how it has affected our family’s story as well! How wonderful it must be to lose your mind to happiness!! Congrats to all of you!! Oh my goodness, I’ve been behind on my blog reading! I just saw Adeye’s post with Vanya’s pic, and the tears are flowing! How precious. How glorious. How great is our God, indeed. To GOD be the glory! So happy for you all!